Bought a new gun safe. Superior Safe Companys "Untouchable" series 45. Weighs 1725 lbs. Getting it into my living room was a real treat. 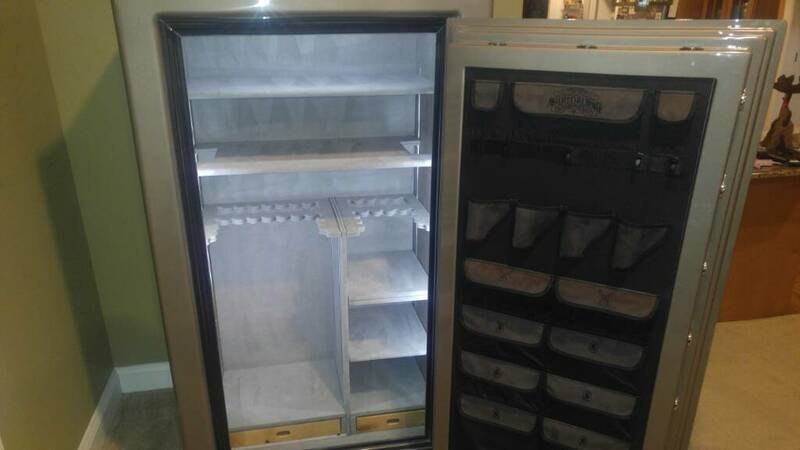 Has 1/4" plate steel body, 1/2" plate steel door, triple fire seals, 3 relockers (with glass relocker). Fire rating is 110 minutes at 1865°. The boltworks in this door are amazing. The bolts themselves arent what fail. Its the boltworks that bend which support the bolts that fail. This mechanism is insane. Attaching some pics of mine, amd a comparison of a cheap boxstore model that had been pryed open for comparison. So far very pleased with the fit, finish, etc. Wife is happy since I took her to pick out the color. Now I just need more guns lol. The pictures make it look smaller than it is. Its 67" high. I dont have a huge collection so I will have lots of room for growth with this. I hope I dont outgrow it. I don't ever want to move it again lol. They are just like a new garage, or any other storage area. Sooner or later, you will grow into it & fill it up. 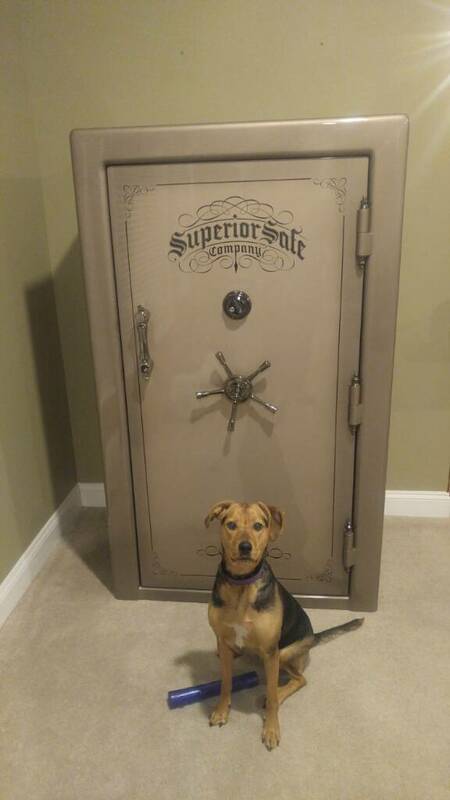 That pup says "we don't need no steenking safe!" If you want it filled real fast get a C&R firearms license. I have a 45 place safe and could use another. Especially when you put a few scoped rifles in it. Impressive looking safe. Looks like you did your research. Watching some of the videos online will make you cringe at the safes that the big box places sell, including Cabelas. They are horribly made. Bolt that sucker down, don't let the weight fool you, most safes that get pried into are done because they were able to be tipped onto their back. I know that this one is thick, but it's still a possibility if they can get it tipped. Yea you are exactly right. It isnt bolted down yet but it will be. Even at over 1700 lbs the door is so heavy when open the back end raises up and gets light lol. Lol, that's awesome. Definitely jealous! JEEZ! That's some safe! Awesome! Whole lot bigger than my gun safe....mine only weighs 250 pounds so I'm afraid some fat Burger Chef hamburger chewing ugly female may come along some night and steal it! If she can find it first. Now fill it up with guns, bullets, documents, Grand National parts, Kim Sum Un survival kits, etc. Nice safe. Really nice! How you got that thing inside is beyond me. I about broke my back getting mine inside, come to think of it, I think it IS broken. Lol. I got a very good deal on it, drove almost 4 hrs and bought direct from the manufactures distribution center. We did have to get creative getting it in. I built a makeshift ramp from my truck bed to deck with (with braces). Had help,from others including one of my former coworker Hunter Engineering reps. I used one of his dolley that we used when moving Hunter alignment racks. Put m the safe on its back on that dolley. I,have an electric 120v winch I hooked to the frame of my deck and winched the dolley and safe onto the deck. Took the sliding glass door off my house and worked it inside. Then leapfrogged sheets of plywood to where it went. Used a 4 wheeler jack to start the safe up, then long 2x6 boards as leverage points. Then 2 pieces of 1/2" conduit for the final movements. It took about 4 hrs to get it off the truck, and into its resting place only 25 feet from the door.